Automatically Loading Files : If DNC Server is running then when you start the DNC Compare program it will automatically load the editor text (if any) into the right side, and it will load the selected file in the DNC Server file list (if any is selected) into the left side and display the differences. Requires DNC Server version 4.1.0.7+. Manually Loading Files DNC Server Editor Button : This button will load the text from the DNC Server editor window. Load Selected File Button - This button will load the the file that is selected in the DNC Server file list. 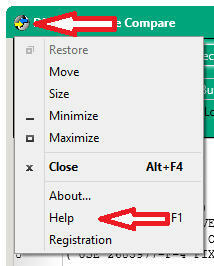 Load Other File Button : This button will bring up Open File Dialog so you can load any text file. 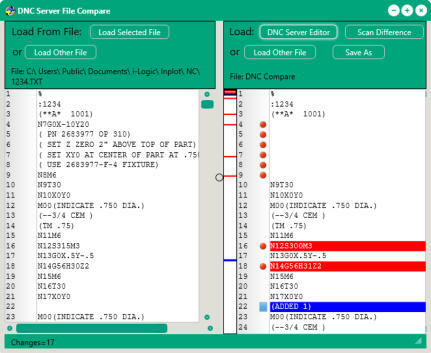 Scan Difference Button : When you load from the DNC Server editor the difference scanning will start automatically. Otherwise, this button can be pressed to start the scanning.